If you should develop a mobility problem and your home or workplace has stairs that you need to use everyday, then you need to look at acquiring a chair lift for stairs. Stair chair lifts are very easily installed into any situation where the condition of the stair tread is good as the railing that the chair lift uses, is attached to the stair tread. 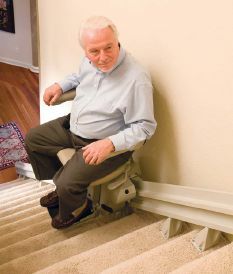 Some chair lifts for stairs have been known to be attached to the wall of the stairs but this is not a safe option. 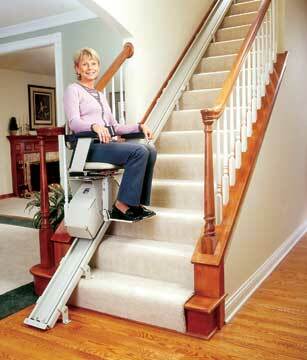 A chair lift for stairs can be both battery operated and AC power operated. Some models of chair lifts give you the option of upgrading the power capacity. What are the points to consider when making a decision to purchase a chair lift for stairs? The height and weight of the user. Special consideration needs to be given to the capacity and strength of the chair lift when the user is of a larger build. Acorn have two available, 294lb & 350lb. Also if your stairs aren't very wide (less than 37″) then a taller person may have difficulty with their knees reaching the other side of the stairs. The option of a standing or perching model may be better in this case than a chair lift for stairs. The persons mobility also needs to be considered because if they can't easily get on and off the chair lift then perhaps a different type, such as a standing or perching platform or a wheel chair lift may be more appropriate. The rail for the chair lift must go right to the top and bottom of the stairs to ensure easy mounting and dismounting for the user. Are the stairs straight or curved? There are different models for straight as opposed to curved. Curved chairlifts for stairs can come in single or double tracks, the latter tends to be more expensive . There are manufacturers of these in the USA, Canada, Europe and England. Standing or perching stair lifts are only suitable for the user who has the ability to stand for at least a minute,the length of time it takes to move up or down the stairs, but there is a rail that they can hold onto for security. If there is a problem with this then using the seated chair lift for stairs will be the best option. The difference between the standing and perching models is the perching model has support beneath the buttocks to help take the weight off the legs. Both models share the same features as seated chairlifts in that the footplate folds up and so do the rails. 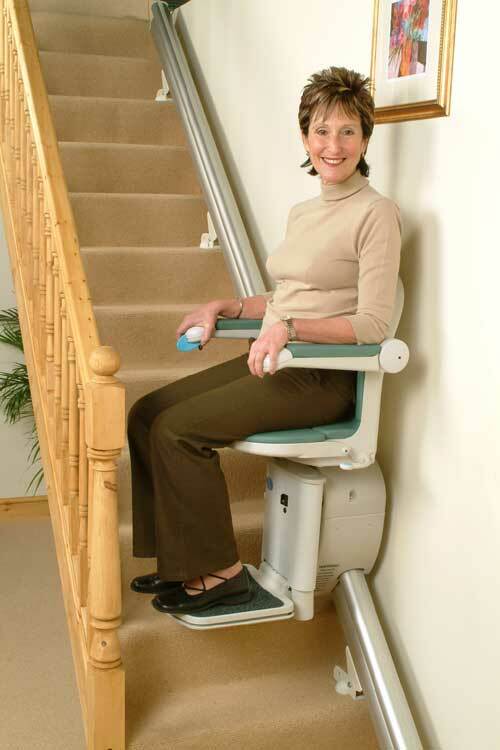 A chairlift for stairs has many useful features such as the ability to use battery and power. Battery operated is useful when there is a power cut, at least you won't be stuck upstairs, downstairs or in-between! Acorn stair lift for chairs have a battery operated model. 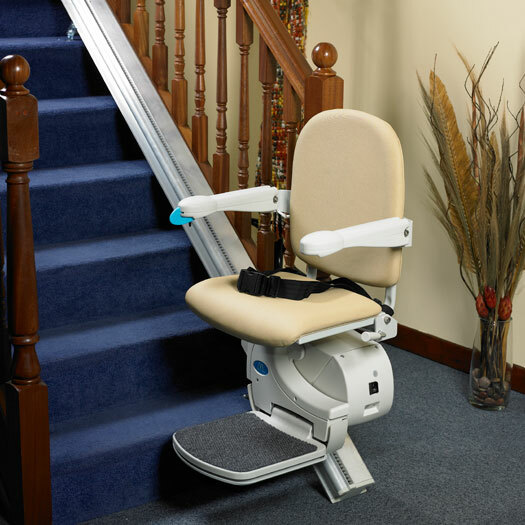 The chair stair lift has a folding footplate and guard rails, which is very useful when the stairway is narrow and when the chair lift isn't in use it is easier for users of the stairs to move past the chair lift. The seat in some models, swivels as well. This is useful in helping a person when mounting and dismounting. They have safety sensors. If an object is in the way of the chair lift when moving up and down it will stop until the obstruction is removed. The controls are easy to use. There is push button, paddle and infrared controls. The infrared controls mean you can call for the lift to be sent to where-ever you are. The paddle switch is located on the end of the seat arm, of the chair lift and of course the remote can be wherever you want to keep it. Braking systems are a very important consideration as a part of safety. There are dual electronic and mechanical ones. This means that the chair lift is unable to descend unexpectedly or at speed. A lockable isolation switch ensures that the chair lift always stops in the correct position.